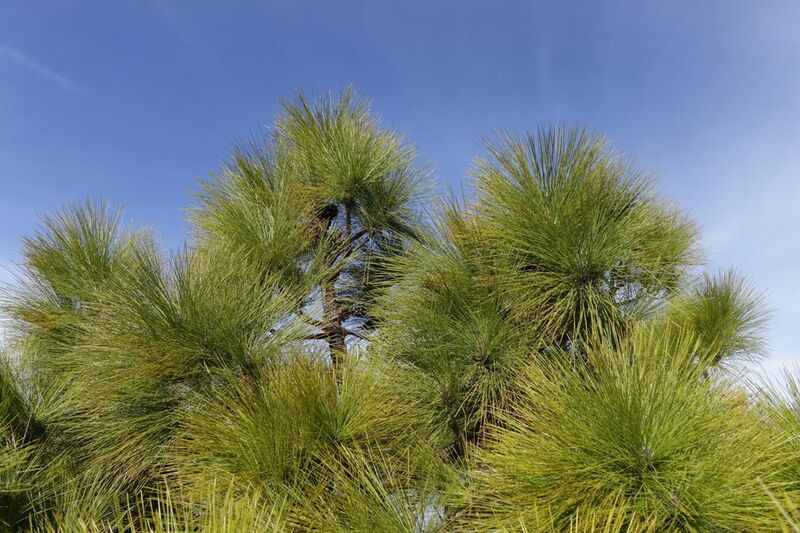 One of the more graceful pine trees, the Canary Island pine features long pine needles that droop attractively, though the branches themselves do not weep. This tree comes to us from the Canary Islands, which are off of the coast of northwest Africa and belong to Spain. In the United States, this species can be found in warmer areas like California, Texas, and Florida. One unusual feature of this tree is that blue-green shoots may start coming out of the lower trunk. These are called epicormic shoots, which develop as a method of combating problems like injury or fire damage. Latin Name: Canary Island pines are classified as Pinus canariensis and belong to the Pinaceae family. Preferred USDA Hardiness Zones: You can plant this tree if you live in Zones 9 to 11. Size & Shape of Canary Island Pine: This pine tree species will generally grow anywhere from 50' to 80' tall and will be about 30' wide. They can sometimes reach heights of over 100' tall. It starts out with a pyramidal shape that can change over the years as the tree matures. It will spread to approximately half as wide as is it tall. Exposure: Plant in full sun for proper growth. It can handle some light shade. Foliage/Flowers/Fruit of Canary Island Pine: There are 3 needles per fascicle. These are some of the longest needles found among pine tree species and can be 12" or longer. Like most pine trees, this tree is monoecious; in spring, male and female strobili (flowers) appear on the tree. Once the female strobili are pollinated, they produce large brown cones that are 6" long. It will take two years and a half years for the pine cones to mature, and they will finally be ready in Autumn. Design Tips: The Canary Island pine is a good choice for a street tree. Since this tree gets sufficiently large enough to shoot past power lines, don't plant it near them or you will have problems. The bark is red which will add an extra boost of color to your yard. Growing Tips For Canary Island Pine: Propagation is performed by planting the seeds from the cones. This tree is not good for alkaline soils unless it is close to neutral. Make sure your tree has adequate water at all times. It can sometimes tolerate drought, but it will perform best if it does not have to struggle for moisture. Maintenance/Pruning: Little pruning is needed for the care of this pine tree. Prune away any branches that are dead, diseased or damaged as the need arises. You will have to be on the lookout for bark beetle infestations. If the problem is severe enough, the tree may need to be removed. If there is oak root fungus in your area, this is a good tree choice as it is resistant. It is also less susceptible to Armillaria root rot, which is caused by Armillaria spp. fungi and may also be known as shoestring root rot. Finally, it is able to withstand Verticillium (fungi)and Texas root rot (caused by Phymatotrichopsis omnivora).